I went bananas over this one. Truly I did. It was light, moist and smelled so good that I had to restrain myself from gulping it all down. "Share..shareeee" , my conscience kept bugging me. This is a recipe I found on The Little Teochew, a home cooking website. I added a streusel top. 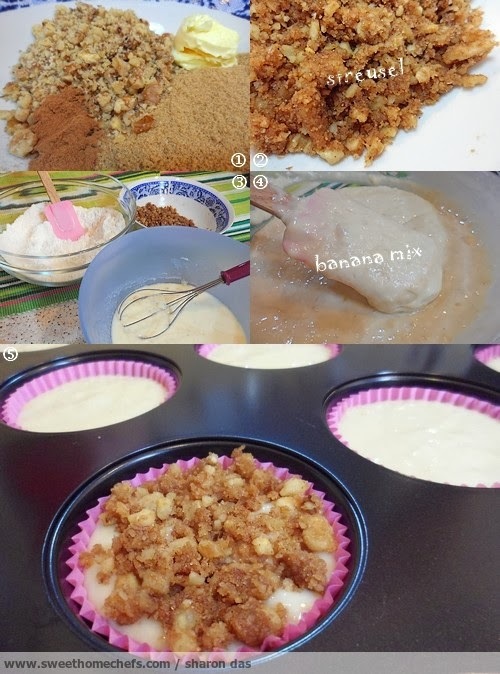 I had pictured in my mind that these banana muffins needed to be crowned with something. It was, after all, my maiden attempt. Check out how gorgeous it turned out. With that, I hereby add this recipe to my must revisit list. Adapted from The Little Teochew. Originally adapted from here, a Williams-Sonoma Essentials of Healthful Cooking masterpiece. 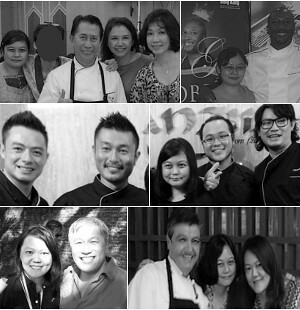 Have highlighted what I did differently from The Little Teochew in purple. Taste-wise, not overly sweet at the bottom because I did not use very ripe bananas. I knew the streusel topping would cover any shortage of sweetness. All in, deliciously light and moist. Note: Bananas were just ripe~not overly, length 6 inch. 1) In a small bowl, use your fingers to combine all the ingredients for the streusel top, until it's crumbly. Leave aside. 2) Preheat oven to 190c. 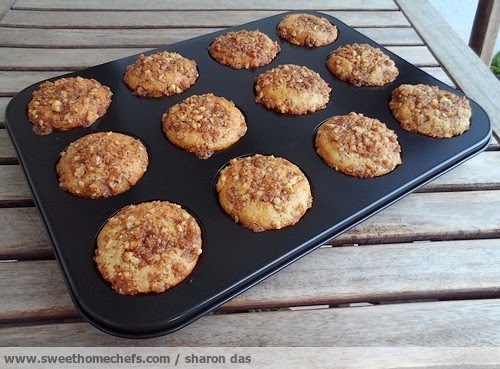 Prepare muffin pan - I used liners ~ managed to get 16 muffins out of this batch. 3) Mix flour, sugar, baking powder and baking soda together in one bowl. 4) In another bowl, whisk buttermilk, bananas, egg, oil and vanilla together. Then, pour this mixture into mixture 3). Stir until combined. 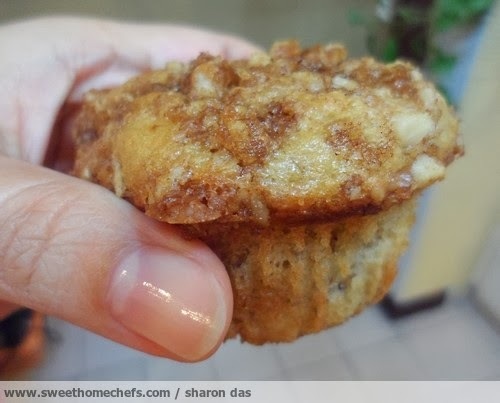 5) Spoon batter into muffin pan (just about ¾ full). Sprinkle streusel on top. 6) Bake for 15-20 minutes at 190c. To check, insert a toothpick into the center. If it comes out clean, it's ready. Let it cool in pan on a wire rack for 15 minutes. Remove muffins. 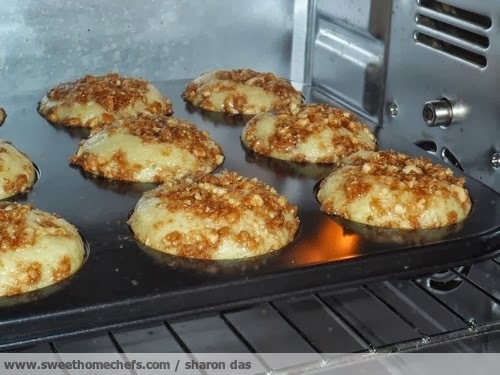 Let muffins cool completely on wire rack. Filled it quite high, haven't we? Ouch...uch! Wait til it cools, will you! 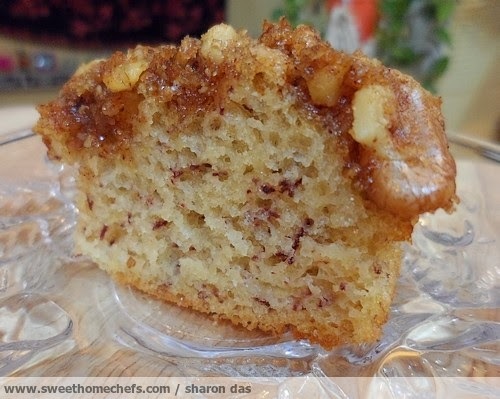 Moist and fluffy center, not overly cakey! Bye everyone. You know where this is headed..
We need to move, don't we. I quite fancy New Zealand. Me too ~ ever since I watched the Lord of the Rings...lol..especially Hobbit land. 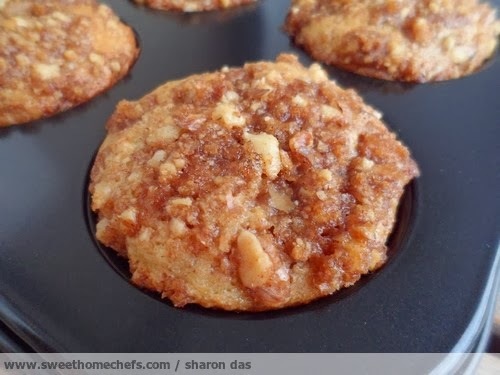 I simply can't resist cakes/muffins with streusel toppings. These must be so yummy! Delightful pictures too! I can feel the crunch in my mouth!! 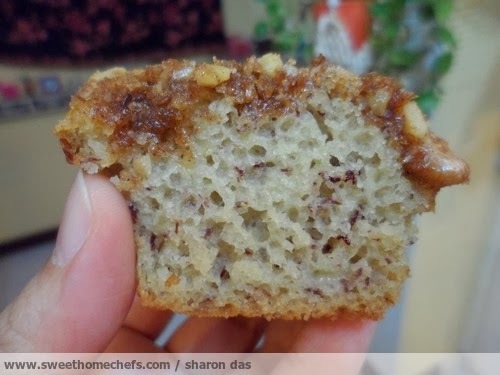 Awesome bakes, Sharon! Thanks for the motivation, Shirley. If we ever meet, I'll bake you a tray because you've often inspired me with your creativity! Thanks for being so sweet, Sharon! I love muffins and these sound great. I printed your recipe and plan to try them. Check out my easy blueberry muffin recipe if you get a chance post on my site. These sound fantastic and perfect with a morning cup of coffee!